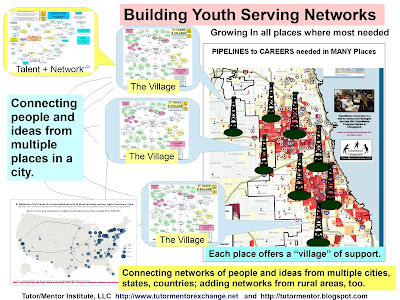 It is really gratifying when I find other programs talking about what the Tutor/Mentor Connection and Tutor/Mentor Exchange, LLC are trying to do to help them and other programs in Chicago. Here's today's blog article on the Fermi Memorial Outreach blog which talks about the Mentoring Summit we hosted in January. This program's organizing a big fund raiser and has written some Fundraiser Wednesday blog articles to tell people about it. 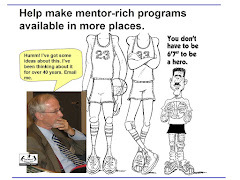 I have just completed updating links in the Tutor/Mentor Connection library and one section points to blog articles by organizations like Fermi Memorial Outreach. There are only 19 blog links in this section meaning not too many tutor/mentor programs in Chicago are using blogs to tell the weekly stories of what happens in their programs or, I just don't know about them. Spread the word. Blogging is a way to attract attention to your organization. It also can offer a writing opportunity for your teens.